“The Jukebox Series” focuses on the 80 records that inhabit my 1963 Seeburg LPC1 jukebox. I’ve had my jukebox (or as I like to call it “the prehistoric iPod”) for a little over twelve years and in that time I’d like to think that I’ve perfected the mix of 45s within. Today’s jukebox classic came out in 1972 when roller skating and roller rinks were all the rage in my eleven year old age group, and the song “Brand New Key” certainly spoke our language. I had already been exposed to Melanie’s music since 1970 through my older sister who became so enamored by her, that she scrambled to not only get her latest Candles In the Rain album, but also her first one called Born To Be. She used to blast “Lay Down (Candles In The Rain)” with The Edwin Hawkins Singers frequently around the house much to the chagrin of my parents. Needless to say, our house was filled with Melanie’s histrionic vocals and songs about peace, beautiful people, leftover wine and Winnie The Pooh, and as a result of her fascination with Melanie Safka. I paid close attention. For Melanie was the consummate hippie and her covers of James Taylor’s “Carolina In My Mind” and The Rolling Stones’ “Ruby Tuesday” introduced my young ears to the original versions. Melanie not only interpreted the popular songs of the day, but she also had quite a few first-rate original songs that were favorites including “What Have They Done To My Song Ma,” “Ring The Living Bell,” “The Nickel Song” and “Beautiful People.” More Melanie albums followed in my sister’s collection including Leftover Wine from 1970, The Good Book from 1971 and Gather Me from 1972, before she left for college and outgrew Melanie. Melanie formed her own Neighborhood record label in 1972 and released today’s single which topped the charts and sold over three million copies. To my sister and her age group, the song was the straw that broke the camel’s back and caused them to pretty much decide that she’d become yesterday’s news. But to my age group, Melanie’s star was on the rise. Forget the apparent double entendre going on in the lyrics to “Brand New Key,” with locks and keys, and “going pretty far,” that was all lost on me and my cohort the first time around. To be honest, I really didn’t like the song much when it was a hit. I saw it for what it was…a novelty that was capitalizing on a craze. However, millions found the song to their liking by sending it up to the top of the charts. Today, the song is a guilty pleasure, but the fact that I have the single in my jukebox says that it is still a nostalgic pleasure. 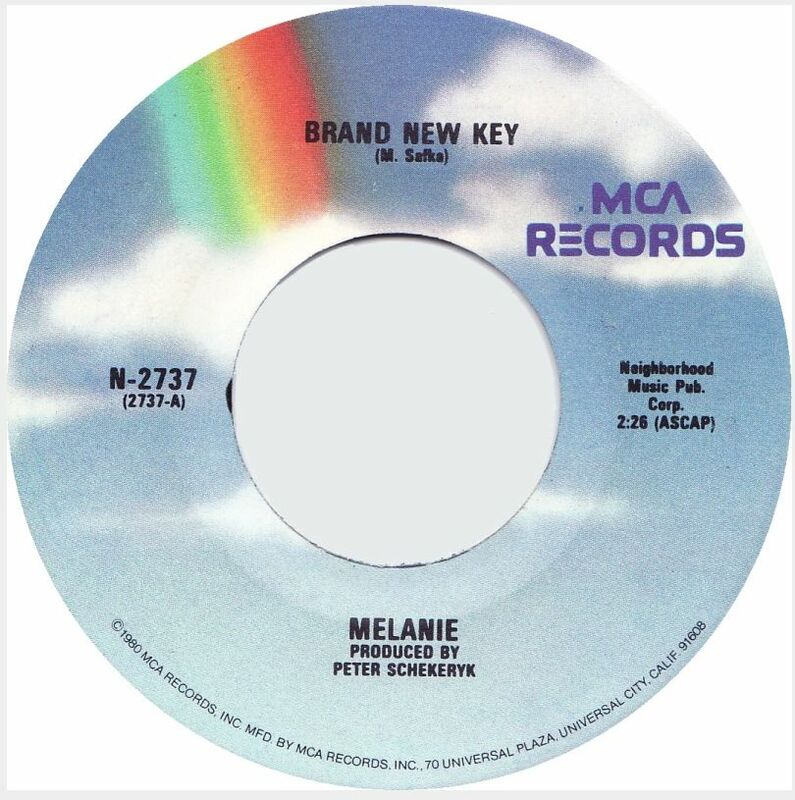 The flip of today’s jukebox classic was the follow-up single to “Brand New Key,” which was also from Melanie’s 1971 Gather Me album. 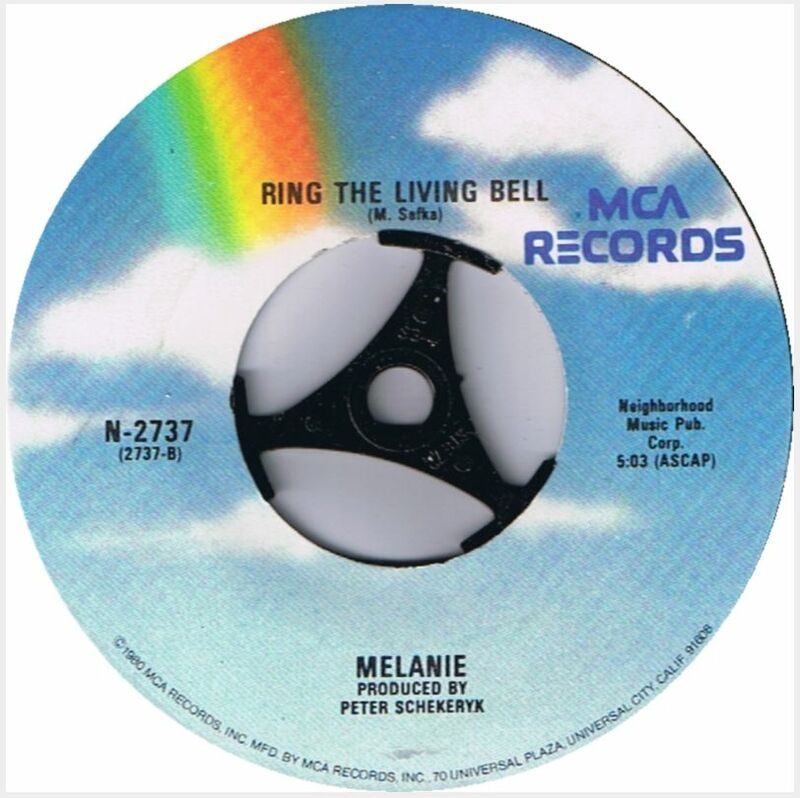 “Ring The Living Bell” is an anthemic song that was written by Melanie with a swelling chorus that reached the #31 position on the pop charts. When Neighborhood Records released the single, Buddah Records (her previous record company) dug up one of Melanie’s older recordings, “The Nickel Song” and released it as a single to compete on the charts. Meanwhile, “Brand New Key” was still on the charts. As a result Melanie became the first artist to have three top forty hits on the charts at the same time. As the 1970s came to an end, so did Melanie’s hit making days. Today, she occasionally performs concerts and releases albums. I never got to see Melanie perform back in the day, but I’d bet it would be a hoot to see her now.